On Tuesday, our little town had some special guests. 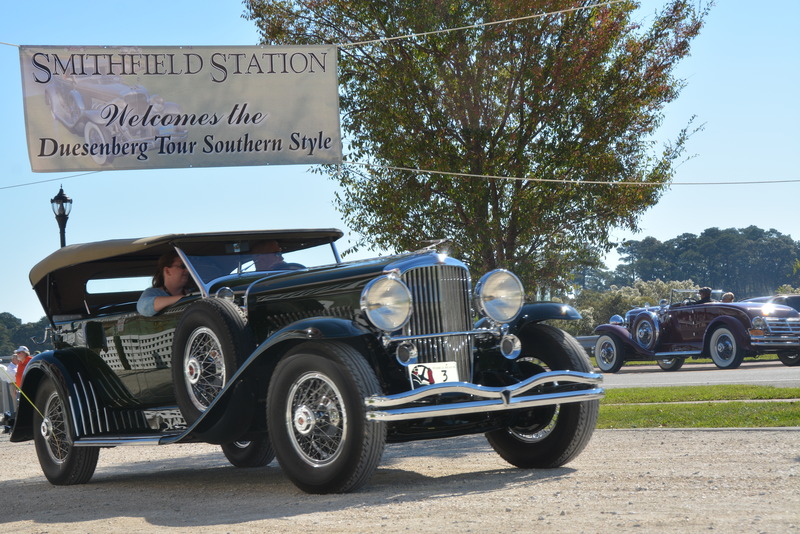 It was one of the stops on The Duesenberg Tour, Southern Style. Motor Man and I waited for them on Main Street. Then followed them the short distance to Smithfield Station, our local waterfront restaurant/marina/hotel, where the drivers enjoyed a coffee break. 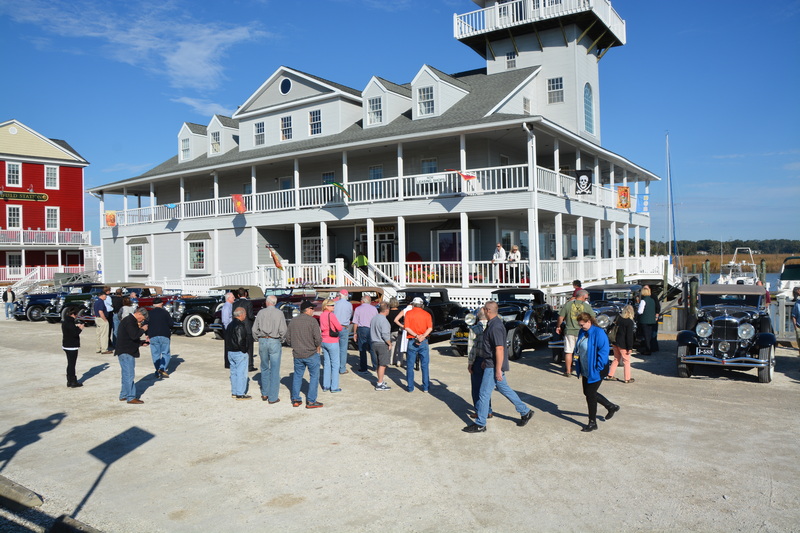 And townfolk enjoyed the cars. There was an abundance of chrome and whitewalls! This red one was a real eye-catcher. 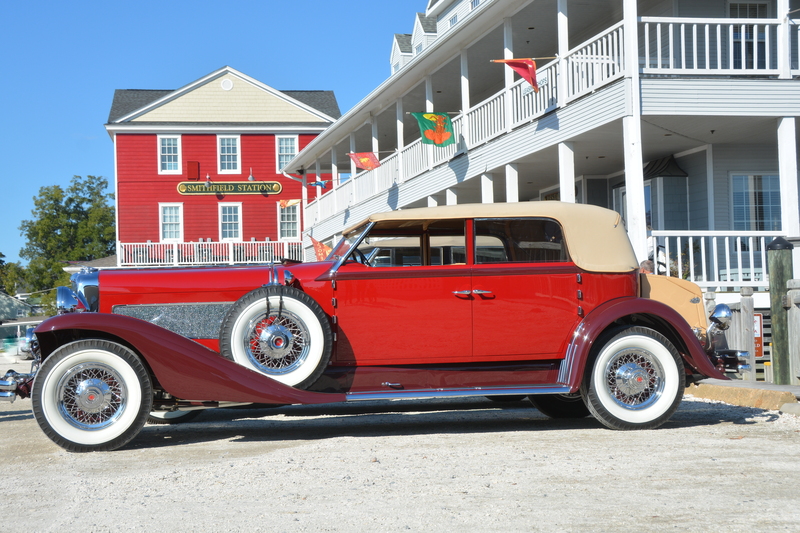 Duesenbergs were luxury cars manufactured during the 1920’s and 1930’s. I’m told there are about 380 still in existence; Jay Leno owns four, and one of our local businessmen (who organized this tour) owns two. 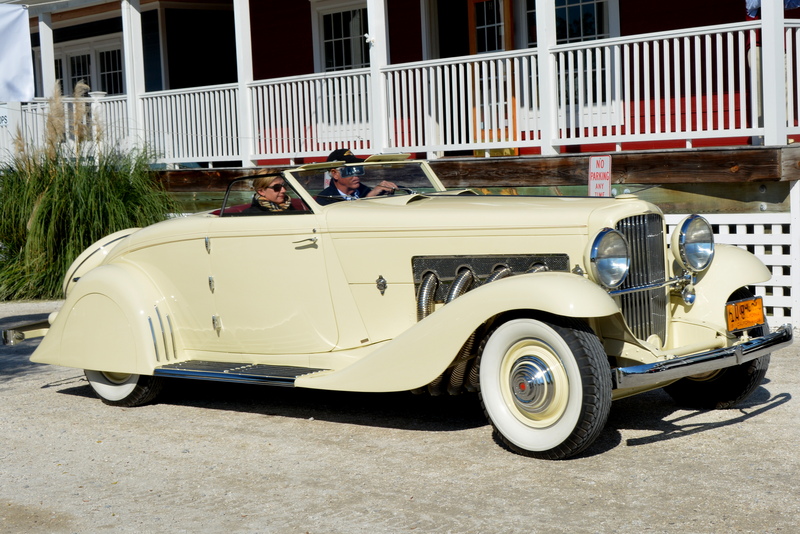 This beauty once belonged to….. Clark Gable. I didn’t know that until the cars had left town and pictures of friends began appearing on Facebook. Pictures taken of them standing beside “Clark’s” car. Had I known, I would definitely have posed beside it too. Smithfield soon bid the Duesenbergs farewell and sent them on to the next stop on their tour. 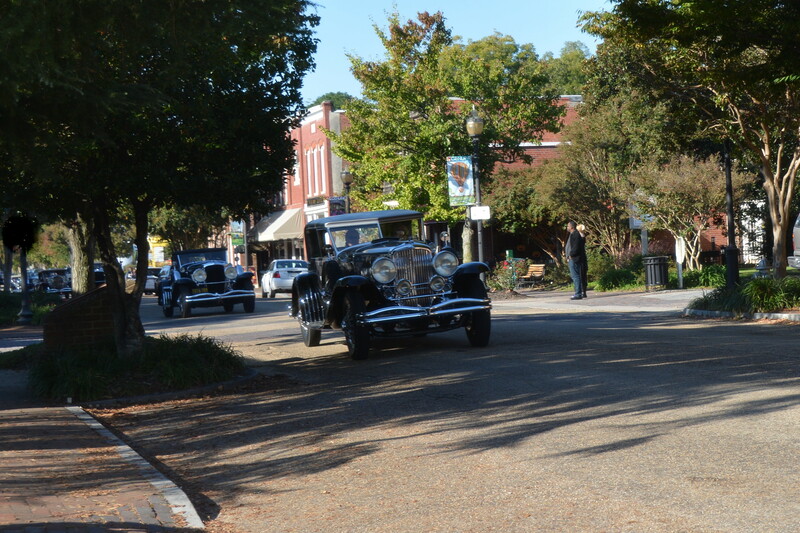 And two days later, I’m still stewing about the fact that I didn’t know that was Clark Gable’s car…..sigh. This entry was posted in Traveling Days and tagged clark gables duesenberg, duesenbergs, smithfield station, smithfield va. Bookmark the permalink. Oh gorgeous! 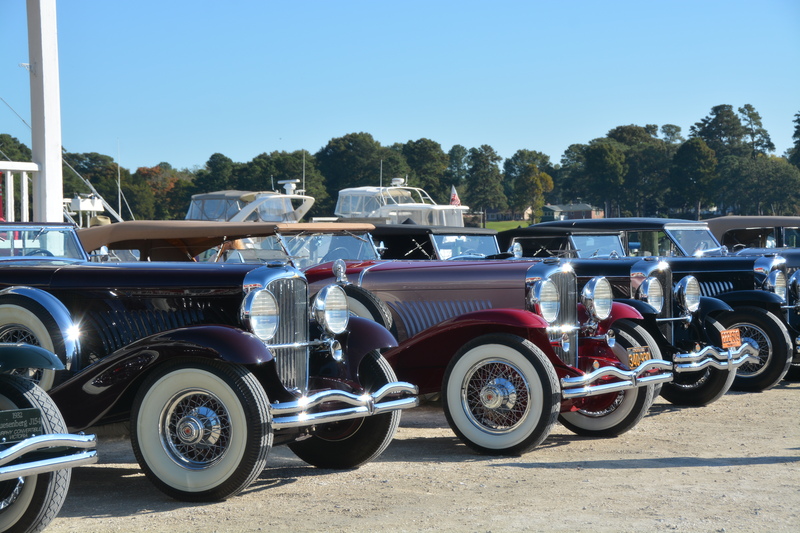 David enjoyed seeing this post today – – – I didn’t know until he told me that the old saying “what a real duesie” (which I always spelled DOOZY) began with the gorgeous Duesenberg……easy to see why! They really are real duesies……love the red one but we loved ALL of them. One fine auto. I knew Leno collected vintage cars but didn’t know he owned two of these beauties. The red one really caught the eye. But I’ll have to admit Clark’s car was simply elegant! Oops!! Remembered you said Leno owned FOUR!! Sorry, Jay! Now, I think I’d have to follow that tour so I could get my picture taken with Clark Gable’s car. WOW!! They are beautiful! Very cool! At least you got to see Clark’s car in person…and got a picture of it! Gorgeous! I can’t call them “ole.” They are timeless and so elegant. This looks like so much fun! There were some amazing cars back in the heyday of the auto industry. Those cars are gorgeous! What a neat event!! Frankly my dear…:) It would be nice to know the history of those grand vehicles.